Our hosting website had some computer denial of service attacks and changed our addresses to help protect us better going forward. Took a few days for us to get what we needed re-configured. Sorry about the delay. Thanks to Nathan from Motoring Alliance and Paul for getting everything squared away. WRAPUP: A beautiful fall day drew 40 MINIs and a Morgan on a great drive along some fun back roads.. A bunch of new members and first-timers came along as well as a bunch of club regulars. Unfortunately the good weather brought out too big a crowd at Starved Rock State Park, so there was only limited parking ability.. Many people headed out to a fantastic lunch at MJ’s Pub and Grill in nearby Oglesby. Special thanks to Rus for planning, pre-driving and leading the drive route and to Chris for coordinating all the food arrangements!! send links of photos to steve@chicagominiclub.com and I will add them here..
Our friends at M7 have offered the Chicago MINI Motoring Club a 5% discount on any M7 Tuning product ordered thru their website. Raceway Woods used to be the home of Meadowdale Raceway in the 1950s and 60s. It was later converted to a Forest preserves. Parts of the old racetrack track can still be seen and explored while hiking in the area. This is a great time to enjoy a short MINI drive, an historic and scenic spot, hang out with MINI friends, and have a casual cookout. WRAPUP: Great weather, fun drive, good eats, and hanging out with MINI friends.. what could be better? 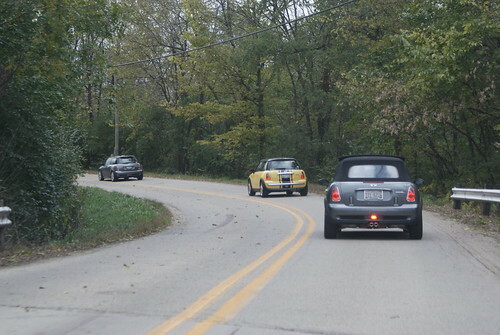 We had a group of 8 MINIs take the backroads to get to Raceway Woods where we were joined by another couple MINIs. We took over the cooking area and had a fun afternoon eating, visiting and checking out the trails. Huge thanks to Rus and Tawana for the drive route planing, and Craig and Beth bringing the grill and attending to the cooking duties!! WRAPUP: Lots of cool cars, a tour of the factory and a delicious lunch.. We were treated to VIP parking, and a chance to view a lineup of WeatherTech race and street cars. We were taken on an extensive tour of the state of the art facility and then a fantastic lunch in the very modern employee parking lot. Huge thanks to Windy City BMW and WeatherTech for inviting our club to this event!! WRAPUP: A cold and rainy day brought a smaller than expected crowd. There were only a few MINIs on display and a couple CMMC spectators, but a good assortment of BMWs braved the bad weather. We got a cool tour of the ZF transmission facility, and CMMC members won some great raffle prizes.. Congrats to David L for winning the MINI division, and to Jim M for taking 2 BMW classes! The Windy City BMW club has invited the Chicago MINI Motoring Club to attend and participate in their annual Vintagefest event. Come check out cool BMWs and MINIs, both old and new.